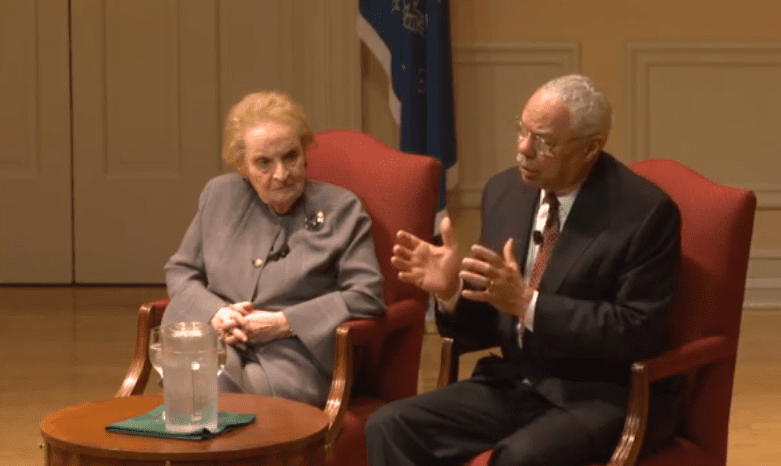 An otherwise reserved discussion of foreign affairs between two legendary secretaries of state included a particularly pointed barb aimed at a would-be commander in chief. Well attended in D.C., moderated by ABC News Chief Washington Correspondent Ann Compton and streamed to University of Hawaii students back home where the Daniel K. Inouye Center is coming together, the affair was nevertheless the sort of event that appeals to political science junkies, policy wonks and those interested in foreign affairs. Stimulating, but perhaps low on fireworks. Former U.S. secretaries of state Madeleine Albright and Colin Powell take part in the debut of the Daniel K. Inouye Distinguished Lecture Series. Once a widely touted potential presidential candidate himself, the former chairman of the Joint Chiefs of Staff used the question to take aim at a current presidential candidate — Donald Trump, whose caustic comments on Mexican immigrants over the past week have caused a major firestorm in the GOP presidential field. After first speaking to challenges in education and human rights, Powell zeroed in. “Child of immigrants,” he continued, pointing to himself. Compton quickly moved the conversation on to the next question, but Powell quietly smiled, clearly having enjoyed delivering the jab. Watch the entire lecture here. The exchange on immigration begins at the 1:13:35 mark.